This plugin integrates the Barclays ePDQ payment gateway with the J2Store shopping cart. You have two default operation code, Sale and Authorization. The brief description of both is given below. You have to capture this either manually or automatically. For Sale, a successful payment will return Status code 9 and for a Successful Authorization, the status code is 5. Both the cases will be treated as Success and Confirmed by the ePDQ plugin. Check the image below for a clear understanding. The following parameters for technical information in your ePDQ account should be set as instructed below. This should be set to SHA-1, as the plugin will not function with other methods. Check the image on how to do this. Also enter a SHA-IN pass pharse here. The same should be entered in the plugin as well. This is required to update our database after the payment is done. 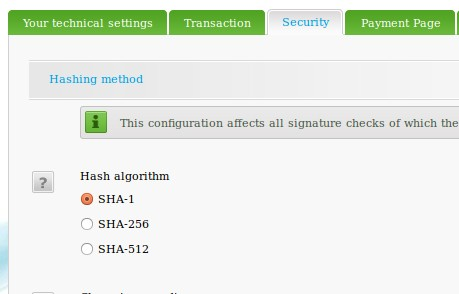 This is the SHA-1 IN signature set up by you in the ePDQ settings (see below for the required settings to be done at your ePDQ account). This ensure security of your transaction. Optional setting. Enter a text that will be displayed as the title of the payment page. Optional setting. Enter a url (https) pointing to your logo image. You can enter a language constant as a value here if you are using a multi-lingual site and then write a language override.